Instead of using a 50 gram standard size servo to control your nitro heli throttle, the G-Force micro throttle servo adaptor allows the use of a light weight 11 gram servo that can reduce the flight weight and lower power consumption on the receiver pack. The G-Force micro throttle servo adaptor uses standard size servo grommets to ensure that vibration is minimized to the micro throttle servo. The G-Force micro throttle servo adaptor weights only 3 grams. When used with a 11 gram Hitec HS-65HB micro throttle servo, you have a 14 gram throttle servo solution. 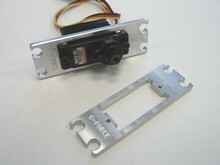 Kit includes single throttle micro servo adaptor plate, M2 mounting screws and instructions.